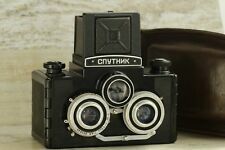 SPUTNIK Soviet medium format (6x6cm) stereo camera - Excellent! Viewfinder is clean, clear. The lenses are fully functional, without scratches, fungus, oil in blades and haze. The shutter works at all speeds and the film advance is smooth. - film accepted: 120. Professionelles Service Unsere Mitarbeiter/Innen leben Fotografie. Condition (N/ND, A - D). B : guter Zustand. Zustand (N/ND, A - D). Shutter: Leaf shutter. Focussing: Manual focus. Image Size: 6x12cm. We also did not receive an instruction manual with this one. It is marked "SPUTNIK" on the front. We believe it takes 120 film. The exterior is in excellent condition. A few very small rub marks on the bottom. "Sputnik", 1955-1973; "Sputnik-2", GOMZ, LOMO. Optics: Triplet T-22 4.5 / 75, base 67 mm, viewfinder lens 2.8 / 75. Focus limit from 1.3 m to infinity. Central shutter (three-petal ST. I send parcels within 24 hours. ). SPUTNIK LOMO. Produced from 1955 to 1973 years. Good condition. Everything is workable. Has very little traces of use. 2 x Lens LOMO T-22 1:4,5 F-75 #065954. for restoration or for parts! About Sputnik. The two-piece back swings open from both sides for film (un)loading. Its reasonable price on the collectors' market has helped bring many into the field of MF stereo. Also the leather carrying bag and filter pouch are in great shape. 2 x Lens LOMO T-22 1:4,5 F-75 #021444. for restoration or for parts! All is fully functional. Lens is clear, no scratches. Focusing and stopping are smooth. Shutter: 1/10, 1/25, 1/50, 1/100 B. Lens: Triplet-22 4.5/75. USSR Stereo camera 6x6 format Sputnik. Work fine. s/n 033440. Stereoscope incl. USSR made. Reflex viewing through single finder lens f2.8/60mm with ground glass screen. by toothed rim. Central shutter ZT.8S coupled, master at right, slave at left. Speeds: 1/15-1/125s. Synchronised X. Film advance by winding button. USSR Stereo camera 6x6 format Sputnik. Work fine. s/n 104694. USSR made. by toothed rim. Central shutter ZT.8S coupled, master at right, slave at left. Speeds: 1/10-1/100s. Film advance by winding button. Shutter speeds tested, looks appropriate. Aperture on both lenses works well. 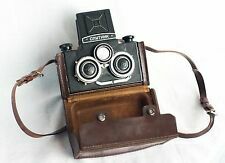 Sputnik Russian Сamera, 6x6cm GOMZ Vintage for 120 roll film, case, Readmy! Stereoscope are included ! USSR Stereo camera 6x6 format Sputnik. s/n 027886. USSR made. Reflex viewing through single finder lens f2.8/60mm with ground glass screen. Excellent working order. All pictures are actual. USSR Stereo camera 6x6 format LOMO Sputnik. Work fine, fully CLA. s/n 009859. USSR made. by toothed rim. Central shutter ZT.8S coupled, master at right, slave at left. Speeds: 1/10-1/100s. Film advance by winding button. Reflex viewing through single finder lens f2.8/60mm with ground glass screen. USSR Stereo camera 6x6 format Sputnik. Case, caps. Stereoscope. s/n 068682. USSR made. Reflex viewing through single finder lens f2.8/60mm with ground glass screen. by toothed rim. Central shutter ZT.8S coupled, master at right, slave at left. Speeds: 1/10-1/100s. USSR Stereo camera 6x6 format LOMO Sputnik. Work fine. s/n 053264. Stereoscope are included ! USSR Stereo camera 6x6 format Sputnik. s/n 211616. USSR made. Set included also, stereoscope and passport. Reflex viewing through single finder lens f2.8/60mm with ground glass screen. Excellent working order. All pictures are actual.